The Marie Goudy 12tet feat. Jocelyn Barth – ‘The Bitter Suite’ CD Release! Harry Vetro – Northern Ranger CD Release! 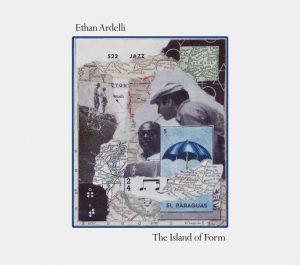 Ethan Ardelli – The Island of Form CD Release Tour! Harry Vetro – Northern Ranger CD Release Tour! Lawful Citizen – ‘Internal Combustion’ Album Release Party! Featuring Special Guest John Hollenbeck, opening the show! Collective Order Vol. 3 CD Release! 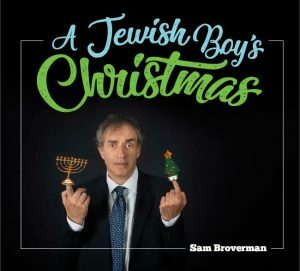 Sam Broverman “A Jewish Boy’s Christmas” CD Release! White Christmas. Let it Snow. Baby It’s Cold Outside. Rudolf the Red-nosed Reindeer. What do these popular Christmas songs have in common (aside from driving you crazy while you do your Christmas shopping)? Some of the most popular Christmas songs of all time (5 of the top 10, according to ASCAP) were written by Jewish songwriters like Irving Berlin, Sammy Cahn, Jule Styne, Frank Loesser, and Johnny Marks. This holiday season, Toronto jazz singer Sam Broverman will again explore and celebrate what it means to be a “Jewish boy” at Christmas time (last year’s show was sold out). In A Jewish Boy’s Christmas, Sam recalls his own experiences as a Jewish boy in the very ethnically mixed north end of Winnipeg, and ties them to the Jewish influence on the Great American Christmas songbook in stories and songs, with a few surprises. With Jordan O’Connor on bass, Peter Hill on piano, and guest singer Whitney Ross-Barris (of whom Sam will ask the musical question Can I Interest You In Hannukah? ; be there to hear her answer), plus a special appearance by members of the Toronto Mendelssohn Choir. A Jewish Boy’s Christmas promises to be a hilarious and touching holiday night out whether you celebrate Christmas or Hannukah…or none of the above! Here is a clip from last year’s show in which Sam explains, in song, how to speak Yiddish: You’re Speaking Yiddish. More about Sam: Sam Broverman is a Toronto based jazz singer and songwriter, as well as a professor of Actuarial Mathematics at the University of Toronto. He has performed in Winnipeg, Vancouver, New York and Hong Kong, and he regularly performs in jazz venues around Toronto. He began his professional singing career in Winnipeg at the age of 19, appearing in theatre and cabaret productions as well as on nationally televised music and variety shows, including Hymn Sing and The Doug Crosley Show. Sam has sung with the Toronto Mendelssohn Choir since moving to Toronto. Jazz Bistro, 251 Victoria St.
Way North ‘Fearless and Kind’ CD Release Tour! Angela Verbrugge: ‘The Night We Couldn’t Say Good Night’ CD Release! NYC pianist Ray Gallon joins a top Vancouver area rhythm section to help Angela Verbrugge celebrate her debut album release. There is no musical setting more intimate than the duo. Each musical gesture is exposed, and without empathic listening on the part of both musicians, it cannot succeed. In the summer of 2017, Davidson traveled to Berlin to study with renowned mallet percussionist David Friedman. In the course of his two month trip, Davidson experimented with a variety of new compositional techniques, and returned to Canada with a new book of songs that he felt best suited the ﬂexibility of the duo setting. These pieces blur the line between composition and improvisation, and draw equally from jazz, free music, and classical composition. 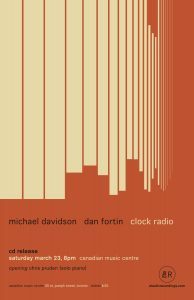 Clock Radio will be released on Elastic Recordings on Friday, March 22nd, 2019.